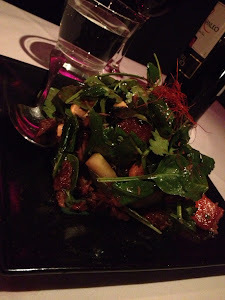 I was lucky enough to be dining in Naga in Kensington recently for our anniversary. It's a stunning looking restaurant with a reputation for great food that sounded right up the missus' street ( I was right). We ate a lot of good food - tempura soft shell crab, fillet of beef stir fried with black beans, spring onion and chilli, black cod perfectly cooked and smeared in a sweet yet savoury orange miso paste - but of everything we ate there was one thing which stood out above all else, and it's that which I would like to focus on. As seems to be the case with many an Asian menu they royally undersell the magic of a dish with its description (my two favourite dishes at Leeds' best Thai restaurant, Thai Aroy Dee, are 'pig leg with rice' and 'shrimp paste rice'), and the same was true at Naga. I'd not even considered this unassuming dish until it was recommended to me by an enthusiastic member of staff. Duck and watermelon salad. It sounds so innocent doesn't it? What it actually is, is the single best dish I've eaten in a very long time. The duck itself is of the slow cooked crispy variety, ah la duck pancakes, but done to such a high quality that you get meltingly tender meat and crispy skin in every mouthful. 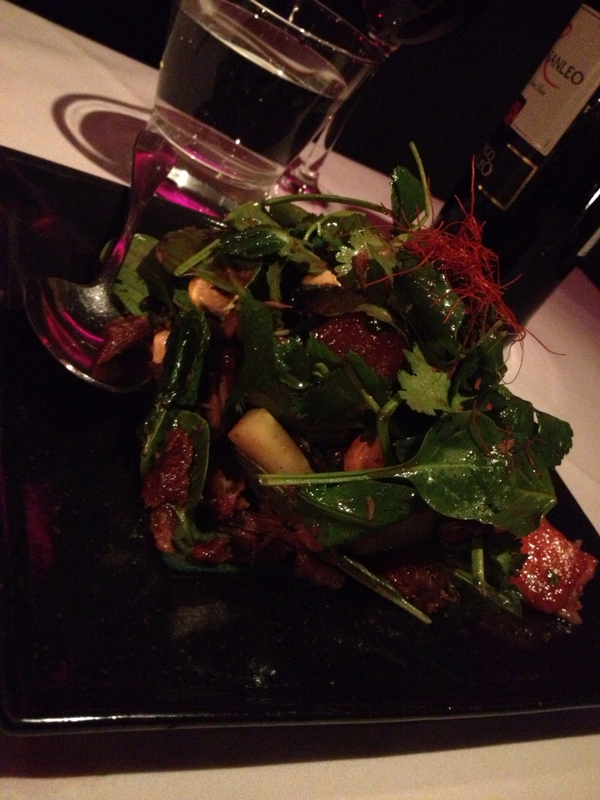 The duck is then complimented by great bunches of Asian herbs (Thai basil, coriander and mint), chunks of refreshing watermelon, as well as slithers of cucumber, red chilli and a sweet and salty dressing which pulls the whole thing together. The dish is just so perfectly balanced between salt, sweet, umami (the duck) and the refreshing, cleansing juice of the watermelon. It's a masterclass. Oh, the beer? They sell Tsingtao and Beer Lao, but that's hardly the point.